The Merrimack Valley Region of New Hampshire offers an excellent selection of lake, river and brook fishing. Fishing in New Hampshire is a favorite way to pass the time. With all the lakes and beautiful scenery, it is no wonder. There are great places to fish throughout New Hampshire. No matter where you are, or plan to be, there is great fishing not far away! Ask us about NH Fishing or share comments. To feature your business, contact us. Species: Brook & Rainbow Trout, Small & Largemouth Bass, Pickerel, Horned Pout, Bluegill. 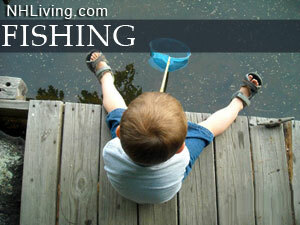 Discover great NH Fishing in every region. Great North Woods, White Mountains, Lakes Region, Dartmouth-Sunapee, Monadnock, Merrimack Valley and Seacoast.